Kick back with a good book (Mai Tai in-hand) while the kiddos splash around the 25,000 square foot heated pool. Wander the gardens to admire lush local flora and feed colorful koi fish. Towering columns and an impressive art collection will make you feel like you're staying in a Grecian palace. Every villa has a furnished private patio, because morning coffee tastes better in the fresh air. Grab some sunnies and the spf – Kalapaki Beach is right outside. A children's pool with a waterslide will keep your kiddos occupied and happy. Pack your cleats! 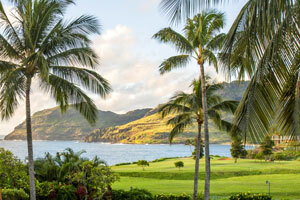 Kauai Lagoon Golf Club is just an 11 minute walk away. Lush gardens and koi ponds make this seaside property extra idyllic. There’s lots to explore on the beautiful Garden Isle, but when you stay at the Marriott’s Kauai Beach Club you may be tempted to spend your whole vacation at the resort. Boasting gorgeous grounds and a covetable locale, Kauai Beach Club features grandeur architecture and lush tropical gardens, all nestled on the protected Kalapaki Bay. Its gentle waves and warm waters make it the ideal spot for taking leisurely swims or boogie boarding with little kiddos - you may even spot some sea turtles! Greet each day from your own furnished patio while sipping Hawaiian coffee freshly brewed in your en-suite kitchenette. Or take a morning stroll to admire local flora, koi ponds, and frolicking Nene birds. Don’t be surprised if the crew is begging to hit the water the minute they’re up, so grab the spf 50 and some towels and head out. The beach is right there, but KBC’s biggest draw is its beautifully-landscaped 26,000 square foot heated pool. You’ll feel transported to a Grecian palace, with statuette fountains and grand colonnades - plus five whirlpool hot tubs and a mini tropical island in the center. Sip on a Mai Tai from the poolside bar and work on your summer glow (any time of year) while the kiddos splash around to their hearts’ content. As dinnertime approaches there’s seven different onsite restaurants and lounges, but why not take advantage of the resort grills for a family cookout (with ocean views)? Head to a nearby market to grab fresh veggies and the catch of the day, and time it so the crew is chowing down on your BBQ feast as the sun sets on the Pacific Ocean. Suites at KBC are bright and inviting, tastefully appointed with island inspired decor and dark wood furnishings - even the murphy beds look elegant! A comfy king in the master and queen size fold-out in the living area make studios and one-bedrooms prime for couple’s trips and small families. A handy kitchenette features fridge, microwave and dishwasher for whipping up light meals while the furnished balcony provides the perfect setting for sipping on a cool beverage at the end of the day. Flat screen HDTV with cable and movies is an added perk. Kauai is home to an array of fine cuisine, but when you feel like staying close to home Duke’s dishes up classic island fare, fresh seafood, and a mean steak for the carnivore in your crew - plus a kaiki (kids) menu. For live music and tasty tropical drinks head to the Barefoot Bar downstairs for Aloha Hour. Either way, save room for the famous Hula Pie! For some R ‘n R swing by Alexander’s Day Spa for an afternoon of pampering. To explore Kauai’s natural beauty and rich history take a day to drive along Holo Holo Koloa Scenic Byway and check out must-see spots like the Maluhia Tree Tunnel, Old Town Koloa, and Puhi Spouting Horn.